Everything you need to know about the Southern Jaguars as they begin the NCAA tournament. The Case For: Southern is not fazed by superior competition. You’ll recall that in 2013, the Jaguars, as a No. 16 seed, came close to upsetting No. 1 seed Gonzaga before falling, 64–58. This is a different team, but it’s led by the same coach, Roman Banks, and it has spent the past two seasons waiting for another tourney shot after being hit with a postseason ban (over APR). The Jaguars don’t have the size to bang with high-major teams—they rank 306th nationally in average height, according to kenpom.com—but they held their own against major-conference squads this season. 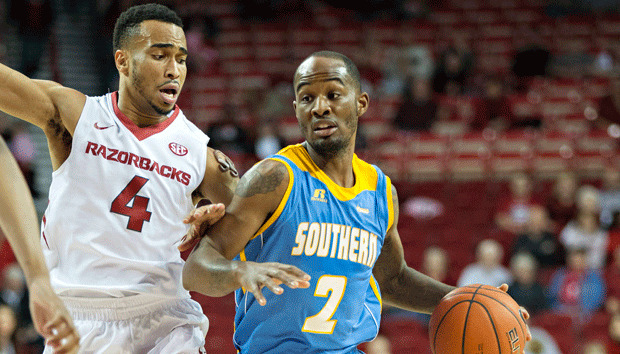 In November, Southern beat Mississippi State in Starkville and upended Tulane at home. The next month the Jaguars won at Wyoming and then pushed Memphis in a five-point loss at FedExForum. Their biggest strength is taking the ball away (39th nationally in steal percentage), but don’t overlook senior Rogers and senior guard Christopher Hyder, both of whom ranked in the top five of the SWAC in Offensive Win Shares. While Southern didn’t finish conference play on a strong note—it dropped four of its final five games—the Jaguars got hot in the SWAC tournament. After ringing up 1.12 points per possession in wins over Alabama State and Texas Southern, respectively, Southern grinded out a 54–53 victory over Jackson St. by notching 0.79 PPP. SI prediction: Lose to Holy Cross in First Four.